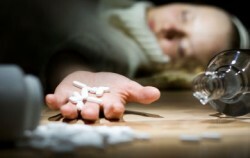 The DEA states, “Physical dependence is a consequence of chronic opioid use, and withdrawal takes place when drug use is discontinued.” When people suddenly stop abusing prescription opiates, heroin, and other types of narcotics, they will encounter a number of symptoms that usually fall into a specific pattern and timeline. Overall, most opiate withdrawal syndromes usually last for week or more, but every case is different. Late stages of Opiate withdrawal include nausea and depression. This period will be uncomfortable as well, and it will be difficult for the individual to go anywhere. It is extremely important that they stay hydrated because the vomiting and diarrhea may cause them to lose a substantial amount of fluids. Those who are addicted to opiates will begin to feel strong cravings at this point which can be very difficult to endure without proper treatment. Many people will feel the symptoms from the late and early stages start to subside but may still be under the effects of their withdrawal. Depression can be difficult during this time and so can general weakness from the body being under such a strain (vomiting, pain, etc). The best action to take is for the individual to go easy for a couple of days following their withdrawal. Make sure that they have someone with them so that they can discuss their feelings, especially if they become depressed, and that they do not try to do too much too fast. What Should I Except for the Opiate Withdrawal Timeline? It is best to give the individual as much time as possible to convalesce and not to expect them to bounce back quickly. They may be able to attend detox or addiction treatment in order to shorten their withdrawal time and to curb some of their worst symptoms. This could be incredibly beneficial to their overall recovery (especially if they are addicted to opiates). Still, every withdrawal syndrome and timeline is different, but treatments like medication, support groups, and therapy can be hugely beneficial.